Kid Street Playground in Bridgewater NJ was recommended by a friend. We headed up there on more than one occasion. Each one was great. It was one of the best and biggest playgrounds we have ever been to. The playground is complete with a ship, a car, giant slides, and most importantly rope swings and a zip line. We had a blast there. Even the older one loves it, and that says a lot! The first time there we wound up coming there on a really hot day (think a l00+ degrees) and the playground is so well shaded that it actually felt about 15 degrees cooler there. Heat aside it is a very well thought through playground with lots of fun things to do for the kids. It isn’t just the plain slide and swings, but much more! There is an area for big kids, and for younger ones, it is fenced all around, so that you don’t feel like your smallest is running off somewhere all the time, it has plenty of shade and some really amazing structures for kids to play on. In fact, my kids love coming back to this playground. Often, the parents sit in the shade right outside the playground with a picnic, while the kids play inside. We have come back to it on more than one occasion, and loved it every time. Keep in mind that after rain it can get pretty muddy. We love mud and playing with it, but it helps to have some old towels in the car for the aftermath. 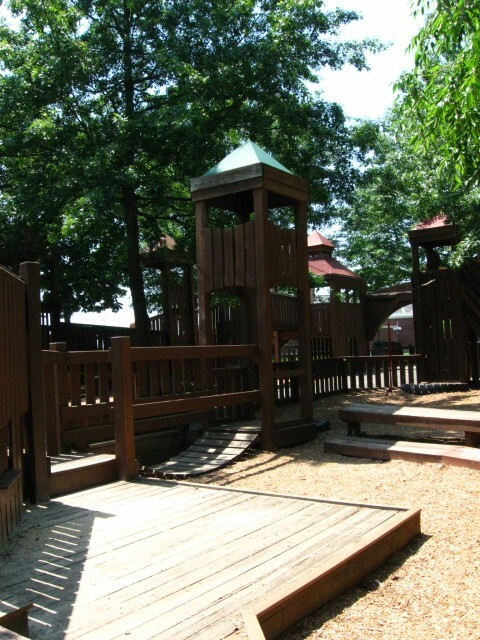 All in all this playground has everything you might want on the playground: great play structures for big and little kids, a fence all around the playground, plenty of shade and sitting space, bathrooms, and ample parking. HERE is more about the park from the NJ Playgrounds.